It has been a busy – not to mention successful – year so far for The Travel Agent Next Door (TTAND), so it should surprise no one that the home-based agency group took some time out this week to celebrate with its supporter in the travel trade. TTAND founder and president, Flemming Friisdahl welcomed guests at the group’s Toronto office telling TTAND’s supplier partners that “without you, we wouldn’t be here today,” and praising to company’s staff for their hard work and commitment. And there was certainly reason to celebrate. TTAND has been in operation for a little over two and a half years and by the end of 2016, Friisdahl said that the group will post sales of $35 million for the year – a significant rise from the $18-million to $19-million that it turned in during 2015. He noted as well that for the group’s 27 suppliers, 43% of the commissions earned by the group are paid out on sales of its preferred suppliers, while 32% are paid out on sales of its approved suppliers. And by the end of this year, Friisdahl told the Toronto gathering that the group will have 360 members – 245 of those classed as primary, with another 115 classed as associates. And by the end of 2017, Friisdahl said that he believed that TTAND will become Canada’s second largest home-based travel agency group, hitting $52 million in sales. 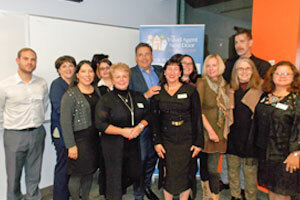 Seen in the photo: Flemming Friisdahl and the gang at the Travel Agent Next Door celebrate their success with the group’s partners during an event at its Toronto headquarters.